With macaroni (noodle), rice or simply with french fries. Now a project of the Declaration Law has been presented so that the peanut soup is considered as the flag dish of Bolivia. The act was held in the House of the Artist of the Ministry of Culture and Tourism with authorities and people linked to Bolivian gastronomy. 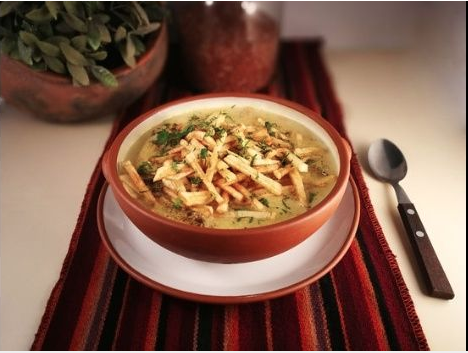 “With this, we started the defense of the cultural heritage of Bolivian gastronomy, we delivered this project so that the peanut soup is the flagship of all Bolivians, and then we will continue working with the other dishes,” said Juan Chacolla, Secretary General of the Federation. Union of Gastronomic and Hotel Workers of Bolivia. In the presentation was also the president of the Association of Chef of Bolivia, Pedro Cadena who recalled that on July 10 began with a vote in the fanpage of the Vice Ministry of Cultures for people to choose from four options which was the right one for receives the name of flag dish. “We presented the four dishes from different regions: peanut soup, pique macho, mixed spicy stew and majau, the most voted was the peanut soup and, as second, the pique macho, we presented the winner and coordinated with the deputy Nora Quisbert to make a bill as a flag dish. We want August 7 to celebrate the Day of the Peanut Soup in Bolivia,” Cadena reported. Quisbert explained that the project will be worked and adapted to be presented to the Plurinational Legislative Assembly. “We could not live without our people and everything they produce and the result of what they produce is that today we enjoy different typical dishes in our country. Wherever we go to any region of the country we find peanut soup, with different ways of preparing, but it is the essence, it will accompany us as part of the country brand in the World Travel Market in London,” said Wilma Alanoca, Minister of Culture and Tourism, who said that by January 2019 there will be a national meeting for all departments to present their flag dish. Bolivian Thoughts opinion: It makes a lot of sense as peanuts are originally from the Chaco region!